Using one of the world’s most powerful digital cameras, scientists with the Dark Energy Survey have discovered eight more faint celestial objects hovering near our Milky Way galaxy, along with signs indicating that they — like the objects found by the same team earlier this year — likely are dwarf satellite galaxies, the smallest and closest known form of galaxies. Three Texas A&M University astronomers — assistant professor and Munnerlyn Astronomical Instrumentation Laboratory manager Jennifer Marshall and graduate students Ting Li and Katelyn Stringer — are authors on the paper reporting the collaboration’s findings, submitted recently to arXiv. 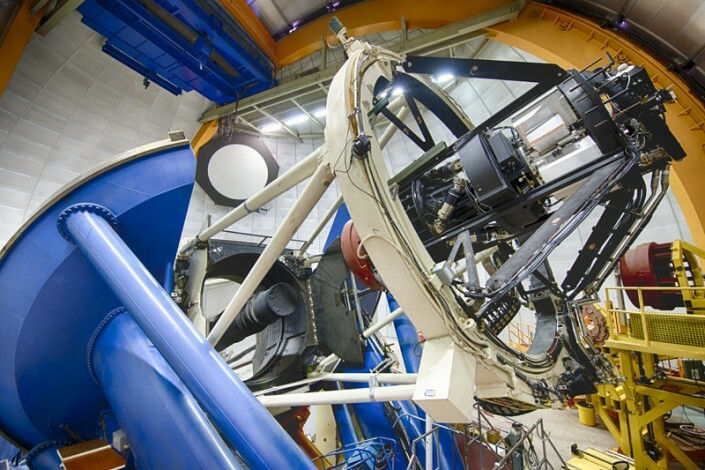 A fourth Texas A&M astronomer, Darren DePoy, deputy director of Texas A&M’s George P. and Cynthia Woods Mitchell Institute for Fundamental Physics and Astronomy and Munnerlyn Lab director, served as project scientist for the Dark Energy Camera (DECam). The main goal of the Dark Energy Survey (DES), as its name suggests, is to better understand the nature of dark energy, the mysterious stuff that makes up about 70 percent of the matter and energy in the universe. Scientists believe that dark energy is the key to understanding why the expansion of the universe is speeding up. To carry out its dark energy mission, DES takes snapshots of hundreds of millions of distant galaxies. However, some of the DES images also contain stars in dwarf galaxies much closer to the Milky Way. The same data can therefore be used to probe both dark energy, which scientists think is driving galaxies apart, and dark matter, which is thought to hold galaxies together. The Dark Energy Survey is a collaboration of more than 300 scientists from 25 institutions in six countries. Its primary instrument, the 570-megapixel Dark Energy Camera, is mounted on the 4-meter Blanco telescope at the National Optical Astronomy Observatory’s Cerro Tololo Inter-American Observatory in Chile, and its data is processed at the National Center for Supercomputing Applications at the University of Illinois at Urbana-Champaign.